I’m one of those “Would you like some coffee with your creamer?” type people. Coffee in and of itself is boring and bitter to me. But I do enjoy its benefits upon occasion. So, to enjoy it, I must make it palatable. Enter: creamer. And lots of it! However, store-bought creamer, even though it is so very yummy, is also so very unhealthy. It’s chock full of yucky things like sugar and preservatives. Since I’ve been doing Trim Healthy Mama, I decided some on plan coffee creamer was in order. So I started making my own! And really, it could NOT be any easier. 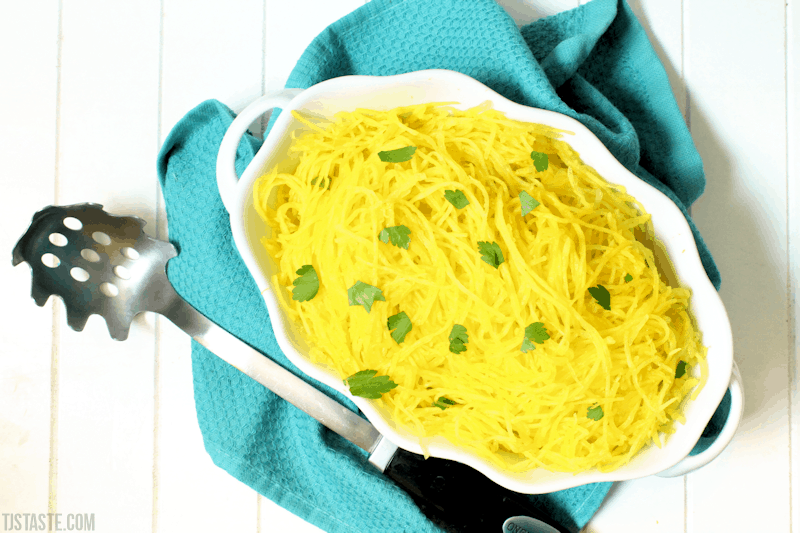 It contains so few ingredients, it’s so fast to whip up, and it tastes so very good! Store in an airtight container in the fridge. Expires whenever the cream or milk therein does. THM NOTE: Each tablespoon of this creamer (when made with unsweetened almond milk and heavy cream) contains about 1.25 grams of fat and negligible carbs (flavoring options listed below are neutral). Therefore, on THM, you can enjoy up to 4 tablespoons (1/4 cup) in an E or FP setting and a whole lot more in an S setting! PRINTABLE TOWARD BOTTOM OF PAGE! Watch the video above! Find the spiffy glass pitcher I used here. 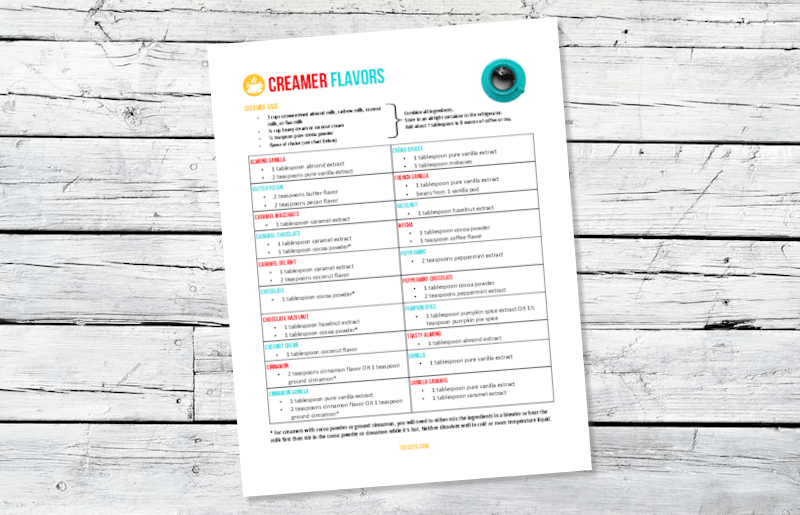 Add one of the following flavor combos (more or less to taste) to one full recipe of the coffee creamer base shared above and in the printable below. 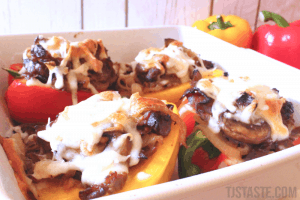 Most of these are inspired by popular Coffee Mate or International Delight creamer flavors! Feel free to freestyle and create your own unique flavor, too. * NOTE 1: For creamers with cocoa powder or ground spices (cinnamon, pumpkin pie spice), you will need to either mix the ingredients in a blender or heat up the milk first then stir in the cocoa powder or ground cinnamon while it’s hot. This is because neither cocoa powder nor ground cinnamon dissolves well in cold or room temperature liquid. NOTE 2: Some readers have been asking about using Young Living’s Vitality (edible) essential oils. Yes, you can use them in this creamer (just add one drop at a time to taste). However, you will need to stir or shake the creamer before using it because the oils will float to the top. NOTE 3: A couple of you asked about adding collagen or protein powder to the creamer. Yes, that can be done as well! Just figure about how much you use of this creamer per serving then add that many servings of collagen or protein powder. You will also probably want to either run the creamer through a blender or heat the milk before adding the collagen or protein powder to keep it from clumping. 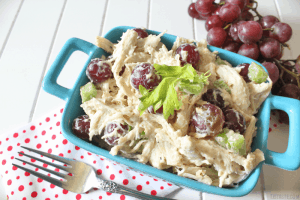 For example, I use the recommended serving size of 2 tablespoons (you can have up to 4 tablespoons which is 1/4 cup in an FP or E setting and more in an S setting) which makes this recipe yield 32 servings. So I would add 32 scoops of either collagen or protein powder (warning: this might thicken it; I haven’t tried it this way, so I’m not sure). But, I personally find it easier to mix the collagen or protein powder into the coffee before adding the creamer (then you don’t have the added step of heating something up before making your creamer). NOTE 4: A few of you asked about adding a thickener to the creamer to make the consistency a bit thicker. 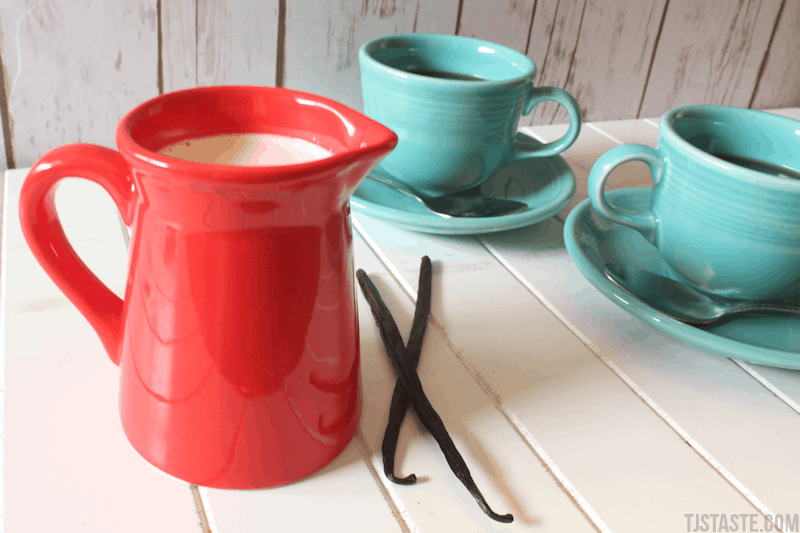 Most of you are satisfied with the creamer’s added thickness as it make it similar to store-bought creamer. However, a few want it a bit thicker. To achieve this, you can add 1/4 to 1/2 teaspoon of either gluccomannan or xanthan gum then run the mixture through a blender to evenly distribute it. It may foam up some from these thickeners (and keep in mind I have not tried this because I really don’t care for either and I like the thickness of this recipe as-is; if any of you try adding the thickeners though, please let me know how it works out for you). 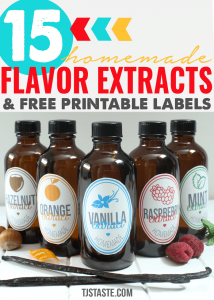 Did you know you can even make your own homemade flavor extracts? 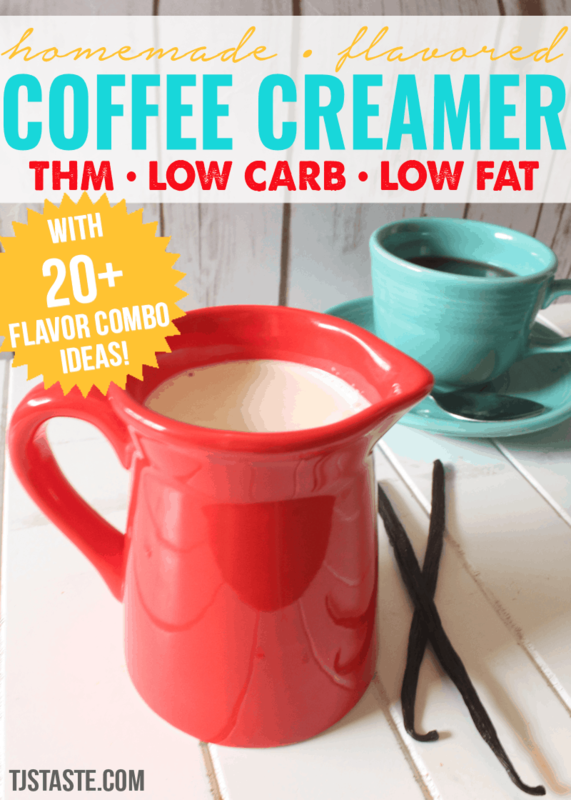 Ditch that sugar and preservative laden store-bought creamer and enjoy this simple, super-easy-to-make low carb, low fat, THM friendly version instead! 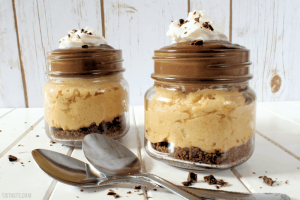 Each tablespoon has 1.25 grams of fat, so you can enjoy as much as 1/4 cup in a Carbalicious (THM E) setting (just be mindful not to go over 5 grams fat with anything else you're enjoying alongside this creamer). In an S setting, quite a bit more can be enjoyed. Am going to try this creamer – so many sound great! Do you have a recipe for salted caramel? That is one my husband likes. Thanks! Hi, Marci. I don’t have one specifically for that yet, but I’ll add it to the list of ideas when I update. 🙂 What you can probably do is just add some mineral salt to the Caramel Macchiato (like around 1/2 teaspoon) and you might need to run it through the blender so the salt mixes in instead of sinking to bottom (but it may sink to bottom anyway, I’m not sure). Or shake it a bit before use. Or add a pinch of salt to the freshly brewed hot coffee (the heat should theoretically dissolve it) then add the Caramel Macchiato homemade creamer. Hope that helps. Have a great day! This is heaven! Thank you dear lady! Tried this one and a coupke other thm creamers (Montana Kitche one and some other). This was by far the easiest and tastiest! Will def be repeating it. This is my first visit. I like what I see thus far. Please ,will you inform this old lady what S E & RHM & any other abbreviations I need to know the meaning of. I would appreciate that information. I’m not vegan, Paleo or concerned with gluten but Like recipes from all. I’m looking forward to trying some of your coffee creamer recipes. Since starting to really concentrate on eating healthy, more fresh fruits and vegetables, less meat, and giving up sugar for the most part have missed the sweetness of my morning coffee. Is there a Stevia product with no additives? I have used the Stevia my husband buys and likes but continual usage upsets my intestinal tract. The Stevia he purchases has additives and I’m hoping that is the cause of the upset. Thank you first for the website and thank you for any help you have time to give me. Have a pleasant rest of the day. 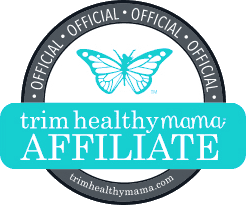 Trim Healthy Mama’s Stevia (you can purchase it HERE) does not have preservatives and it’s the one I’d recommend most. 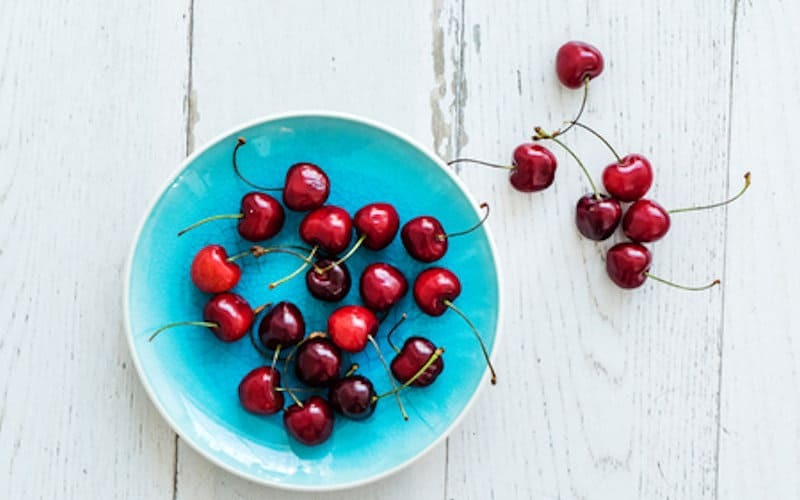 If you still have troubles with it, you might have a sensitivity to it and could try other sweeteners such as monk fruit (but for this recipe, you’d need more monk fruit to sweeten it enough). Hope that helps! Please let me know if you need clarification or have further questions. Have a great day, Mary! Hi, I am anxious to try this recipe when I get back from my travels but right now I am on the road and was actually searching for a recipe for a powdered healthy creamer because I can’t stand Coffee-Mate and other brands. Have you come up with anything powdered? It would be so handy when I travel to have my own powdered creamer that couldn’t spoil to keep in my purse and or motel room. Hope that helps. Have a great day, MaryLou! No need to be anxious. It shouldn’t make you nervous. I’m EAGER to try it… !!! Sorry if I’m missing something or not reading it right but want to know– early in the post it says 3c almond milk to 3/4c cream. And then lower in the post it says 3c to 1c cream. Which one should I use? Hi, Alice. Good eye! It’s one cup. I’ll get it changed right away. Thank you so much for posting these, my husband is trying to quit his coffee creamer while babystepping his way into THM. I have a question…for the french vanilla, do you just throw the vanilla beans from the pod into the mix? I have never used vanilla beans before. Thank you! Yes, you scrape them out from the pod then just throw them in there. 🙂 There are lots of YouTube videos on how to get the beans out. You basically cut a slit in the pod then use the back of your knife to scrape out the beans. thank you! 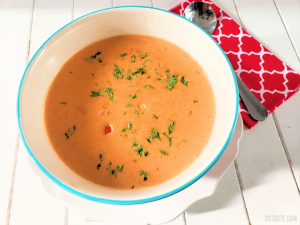 One more question…can I use coconut milk in lieu of coconut cream? I’m confused by the 1/4 tsp stevia (8 doonks) ingredient – are you really only using 1/4 tsp of sweetner in the entire batch? What is 8 doonks? Thank you so much! I’m usually a black coffee drinker, but every now and then I want the coffee shop experience. I love that I can freeze it, because the feeling doesn’t hit that often. I do, however have a request: a coffeeshop where we used to live had a Christmas drink made with eggnog – and my dear husband loves it. Can you help come up with an eggnog flavored creamer, because this would be way healthier than eggnog in his coffee! Thanks. Hi, Kim. Sure! I might post it as a Christmas creamer edition too. 🙂 Here’s what you can try: to the base recipe above, add: 2 teaspoons unsulphured blackstrap molasses; 1/2 teaspoon each ground nutmeg, ground cinnamon, ground allspice, and ground ginger; 1 teaspoon vanilla extract; and 1 teaspoon rum extract. Try that and please let me know how you like it! Have a great day, Kim! I can’t wait to try these creamers. 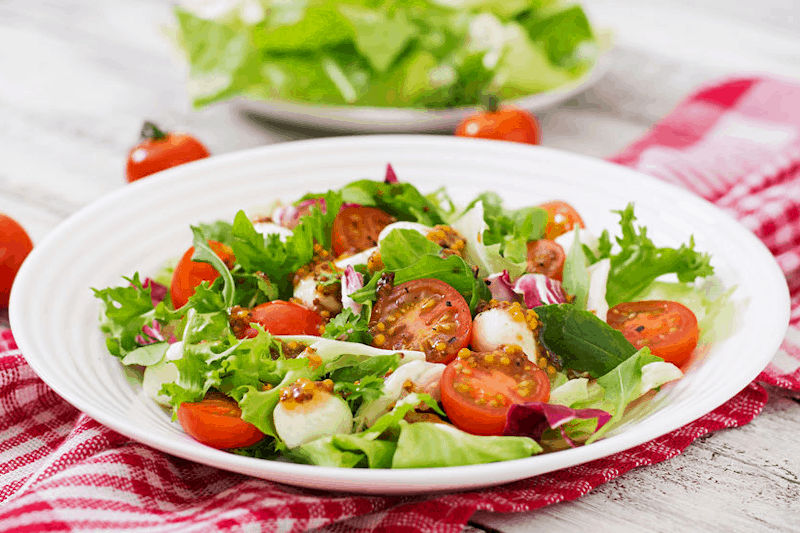 What is the carb count if using Heavy cream and almond milk? Can’t wait to try this. I have been using plain heavy whipping cream in my coffee. Dr wants me to lower fat in my diet. I am gonna compare fat of heavy cream and then your creamer hoping it is healthier and better for me. Thank you for posting the flavors so at least i can do that with my heavy cream. I too am one of those who likes a little coffee with my creamer, lol! My thought was well I’ve tried other things that really didn’t work so give it a go and lol and behold I LOVE IT! I used butter vanilla flavor and next time I’ll try caramel. OMG my new creamer and it doesn’t have all that sugar in it (I used coconut cream instead of heavy cream). Thank you for saving the day! Hi, Carol! Glad you love it. 😀 Have a great day! Love you lady! Hazelnut coffee creamer is spot on! I FINALLY got myself off of flavored creamer, but I do miss it sometimes! So glad I came across this! Question: Do I add the flavorings directly in my cup or in a bottle of creamer? That may seem silly to ask, but I’m not sure! Thank you for the neat printable as well! I have it in my binder that I printed from your site some time ago! You are AWESOME! Hi, Amber. 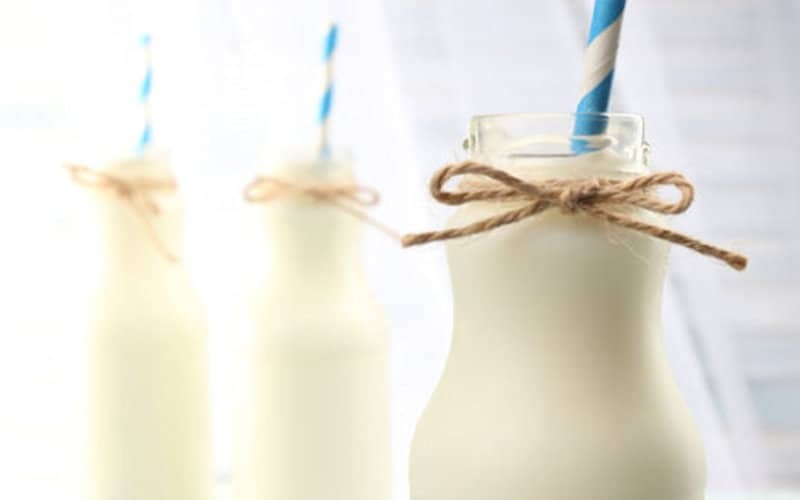 You add the flavorings to bottle with your homemade creamer. 🙂 I always give it a little shake too before adding to coffee. Love it! Popular enough other bloggers are copy catting with their own creamer recipes now lol. YOU are my THM hero right now! Thank you so much for sharing this!!!! I found this an thought wow! But I tried the hazelnut… My favorite, I have used coffee mate for 17yrs. Now I find myself not able to have some of the ingredients. Although this is excellent in calories an fat it just doesn’t have the hazelnut flavor. I didn’t change anything but I was thinking about ordering some hazelnut powder and dissolving it in another batch when I can get it in. Hoping it will be closer to the flavor. I know the richness/creamy won’t be there..
Hi, Marie. So Hazelnut is my fave too and I make it all the time. I tried a brand OTHER than Watkins and it didn’t taste right. So I’m wondering if maybe it needs to be the Watkins brand? I’m not sure. Hopefully that’s helpful. Did you end up trying the powder? How’d it turn out? I haven’t bought the hazelnut powder but I started using hazelnut flavoring syrup an it works good. Ooh, did you find a syrup that’s not sweetened? Yes, Walmart, heb and I have seen it another place. Can protein powder or collagen be added? Hi, Kay! It sure can. I just added a note in the article addressing this. 🙂 Have a great day! Silly question … what is coconut cream? I know cream of coconut milk… which is high in sugar. And I know the carton of coconut milk- and I know the can of coconut milk. Please help this girl out…my mom needs the dairy- free version. Hi, Lois. Sorry to hear that! What brand of stevia did you try? Many brands have a bitter flavor, at least to some people. Oh, and what kind and brand of molasses? A friend is here visiting and watched me respond and said that she finds any kind of molasses bitter. If that’s the case (like you’re one of the people who finds molasses bitter), you should be able to return the bottle of molasses. go off your diet and make molasses cookies! Love the peppermint mocha one for Christmas! Hi, I’m hoping you know, with this recipe for creamer, what is the best substitute for Almond milk? I’m allergic. So glad I found this option to try! Hello! I came across your creamer recipe thru the THM main FB Page… I’m so excited to try the various flavors out. I do have a question: can I use coconut extract in place of coconut flavor? You are my personal hero for this!!! I’m just now reintroducing coffee, but I’ve had a hard time finding a healthy creamer (I can’t have dairy, so I’m using the coconut cream option.) I’ve been using sugar free storebought creamer 😛 Glad I can stop doing that!!! I have only bought Gentle Sweet and Super Sweet from THM. Do you know how much that would be instead of the Pure Stevia? Hi, Lisa. You’d need 3 tablespoons Super Sweet Blend or 6 tablespoons Gentle Sweet. I figured this using the sweetener conversion chart found on the THM website. 🙂 Hope this helps. Have a blessed day, Lisa! Thank you so much! Just tried the vanilla caramel creamer!! It is so good!!!! Thank you so much for posting this information. I am a newbie with THM and have been really trying to figure our how to handle my coffee in the morning. Thank you! Thank you thank you thank you!!!! I’ve been drinking black coffee for so long!! I didn’t know I could do up to 4 (FOUR!) 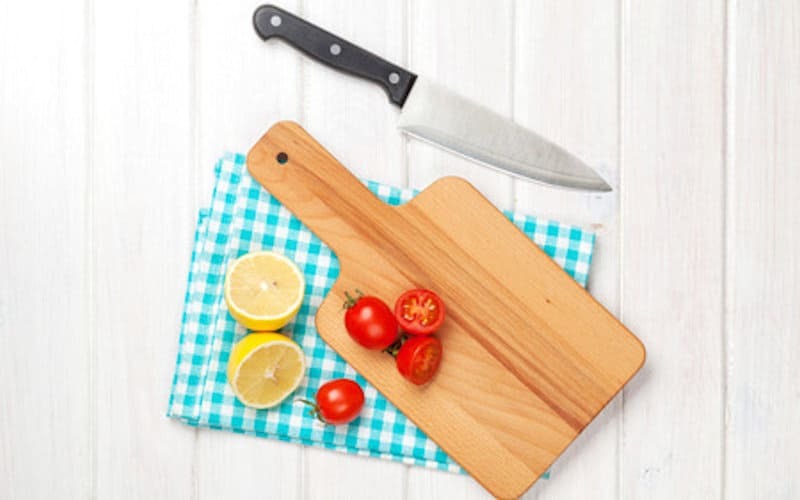 tablespoons of something like this!!! I must say it one more time…. thank you!